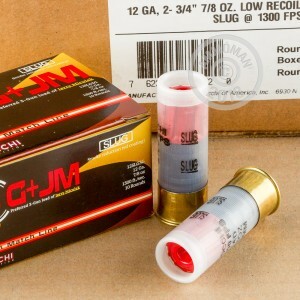 These reduced recoil rifled slugs are just the medicine you need to ring gongs and turn spinners with your 12 gauge before hitting the dump barrel burning down the rest of stage! Fiocchi, an Italian manufacturer, is a longtime supporter of shooting sports and has been a faithful sponsor to champion-level shooters like Jerry Miculek as well as to junior training camps for up-and-coming 3-gunners. 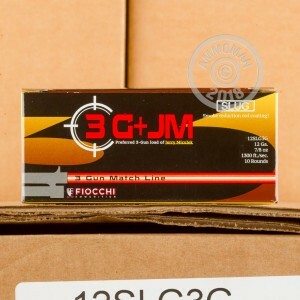 With careful input and feedback from their athletes, Fiocchi has been able to design a new line of 3-Gun specific ammunition which includes these match-winning slug loads. Each of these 12 gauge shotshells uses a transparent hull for unmistakable segregation from your birdshot; inside you can see a cushioning wad and premium 7/8 ounce lead slug which has been colored bright red to help you call any misses and adjust as necessary. The hull is also designed with a high crimp and curved edges which lend speed and buttery smoothness to every reloading technique. 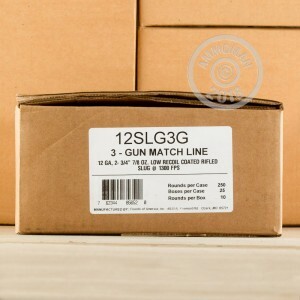 Whether you dual-load, quad-load, or perform a traditional support-side reload, the 2-3/4 inch shell length provides easy handling while maintaining compatibility with the most popular FN SLP, Benelli M2, and Browning A5. Competitors will find that this low-recoil load decreases the time it takes to get back on target so that they don't have to rub their sore shoulders on the way to the prize table.